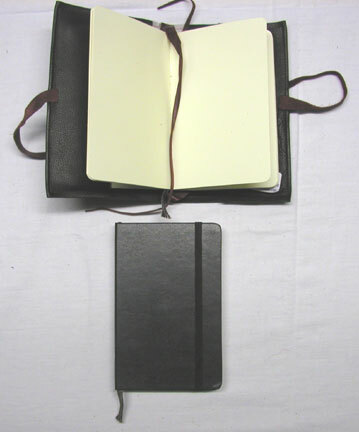 What is a Moleskine (pronounced "Mō lă skee nă")? Centuries ago aritists carried sketch or writing pads with them upon their travels. 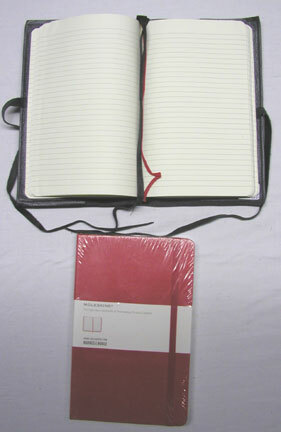 Today these pads are produced for the modern artist/writer - see pictures below. Individuals who enjoy the Moleskine art and journal books have asked for covers to protect them while traveling in their purses or bags. The above is the 3 1/2"x5 1/2" book size. Click on the picture for In Stock items. Leather with semi precious gem stones or fabric embellished with antique or collector buttons, all signed and numbered by T.K. Hall. No one is the same. There is a limited number of these as the fantasy novel trilogy "A Perfect World" takes off. Below are the 5 1/4"x8 1/4" size, Click on the picture for In Stock items. Place a leather strap/ribbon toward the back of the book to hold the spine in place. Use the other leather strap/ribbon to mark where you left off. Use the side leathers to tie a bow/wrap ribbon around button to keep it closed.